Former Florida Gov. 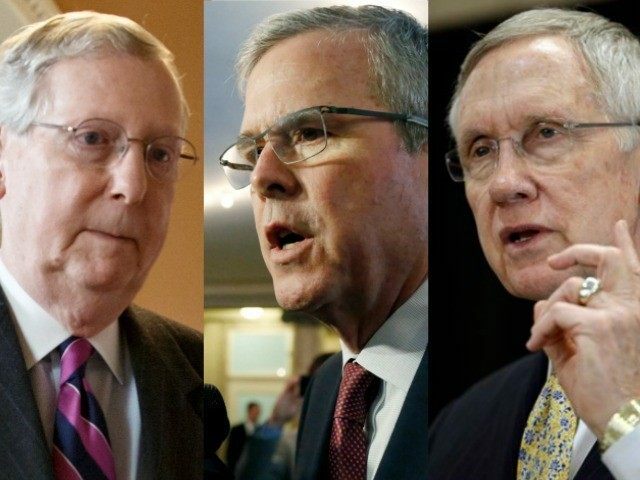 Jeb Bush has joined Senate Minority Leader Harry Reid in calling for Senate Majority Leader Mitch McConnell to abandon his pre-election promise to fight President Obama’s executive amnesty by holding a vote to confirm U.S. Attorney Loretta Lynch as Attorney General. “I think that presidents have the right to pick their team,” Bush said in New Hampshire at an event with about 95 voters and “a horde of media,” according to Time Magazine’s Zeke Miller. “The longer it takes to confirm her, the longer Eric Holder stays as Attorney General,” Bush said, echoing a talking point that Sen. Lindsey Graham (R-SC) has used to justify his planned vote for Lynch–even though a vote for her is a vote for Obama’s executive amnesty. Bush’s move comes as he’s lost his frontrunner status–despite all the money he’s raking in–in the 2016 GOP primary to Wisconsin Gov. Scott Walker, who opposes Lynch’s nomination and now leads Bush in polls in all three early primary states. Reid, appearing on Rachel Maddow’s MSNBC program on Thursday, also—like Bush—called for Senate Republicans to confirm Lynch immediately. “I had a conversation today with a number of Republicans and told them really to get her done, or I will make sure they will have an opportunity to vote against her,” Reid said. The Huffington Post then laid out, citing Reid’s top aide Adam Jentleson, how the Senate Minority Leader would force a vote on Lynch if the GOP leaders like McConnell keep blocking the vote. McConnell promised before the midterm 2014 election—in which voters delivered him a GOP majority with an historic nine-seat-swing—that if the Senate went Republican, there would be no vote on any attorney general nominee to replace Eric Holder if that nominee supports Obama’s executive amnesty. 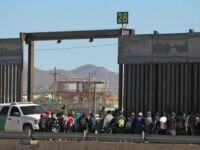 During her confirmation hearings, she not only endorsed Obama’s executive amnesty—which has since been deemed illegal and unconstitutional by a federal judge, Judge Andrew S. Hanen of Texas, who issued a stay against the program’s implementation—but she came out publicly for an extraordinarily radical position that puts illegal aliens ahead of Americans. “I believe the right and the obligation to work is one that is shared by everyone in this country, regardless of how they came here,” Lynch said during questioning from Sen. Jeff Sessions, the chairman of the Senate Judiciary Committee’s subcommittee on Immigration and the National Interest, on whether illegal aliens or Americans have more of a right to work in America. “Certainly, if someone is here—regardless of status—I would prefer that they be participating in the workplace than not participating in the workplace,” Lynch added. 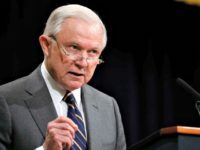 Sessions then issued a lengthy statement saying that Lynch should be opposed because of this, and he’s since been joined by nearly all Senate Republicans—including the massively pro-amnesty Sen. John McCain (R-AZ), who is running for re-election but is likely to face a conservative primary challenge from either Rep. Matt Salmon (R-AZ), state Sen. Kelli Ward or both. Ward, in an exclusive with Breitbart News, laid out how if any Republican votes for Lynch that McCain will be personally responsible for her confirmation and everything that happens as a result even though he plans to personally vote against her. McCain’s spokesman Brian Rogers hasn’t answered when asked repeatedly what—if anything—McCain has done, outside of an interview with nationally syndicated radio host Hugh Hewitt where he said no Republican should vote for Lynch ,to get his colleagues who say they plan to vote for her to reconsider. At this time, there are only five Senate Republicans who plan to support Lynch: Sens. Lindsey Graham (R-SC), Jeff Flake (R-AZ), Susan Collins (R-ME), Orrin Hatch (R-UT), and Mark Kirk (R-IL). McCain has already endorsed Graham for president, should the South Carolinian decide to launch a long-shot bid for the GOP nomination—he’s not expected to even have the remotest chance at winning, even in his own home state of South Carolina since he barely won re-election against a field of jayvee primary challengers last cycle—but he won’t say whether he’ll pull the endorsement of Graham should Graham vote for Lynch. Flake is McCain’s Arizona colleague and would likely do anything McCain tells him to, but McCain hasn’t said what consequences would come Flake’s way if he votes for Lynch. Collins just won re-election last cycle and won’t face voters again until 2020, assuming she decides to run again then—and her planned vote for Lynch comes after she just supported adding nearly $200 billion to the national debt via the “doc fix” vote as part of the biggest GOP-led increase in unchecked spending since George W. Bush, Jeb’s brother, was president. Hatch, who plans to retire at the end of this term, will never face voters again—and just on Thursday moved forward with an effort to slip through support for the fast track trade promotion authority effort that is one of Obama’s biggest initiatives. Kirk barely won his Senate seat back in 2010 and will likely face a conservative Republican primary challenge over his planned vote for Lynch, as well. Bush’s support for Lynch comes as he has dramatically fallen apart in early Republican primary states. Wisconsin Gov. Scott Walker—who previously came out against Lynch in an exclusive with Breitbart News—is now leading Bush in Iowa, South Carolina, and New Hampshire according to recent polls from all three states. “Given Loretta Lynch’s failure to commit to protect Americans from the president’s lawless executive overreach, that even he said nearly two dozen times, she is not fit to serve as the nation’s Attorney General,” Walker spokeswoman Kirsten Kukowski told Breitbart News in early March.